Supporting your health is always beautiful with Nature' Bounty Optimal Solutions Advanced Collagen Beauty Formula. 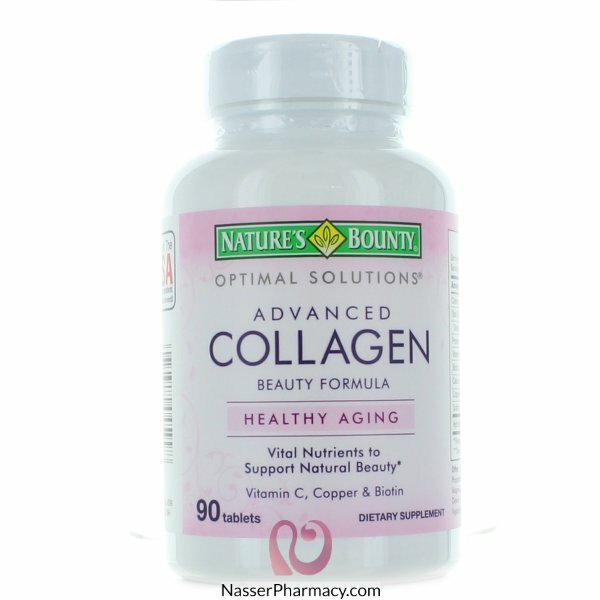 Nature' Bounty Advanced Collagen Beauty Formula provides an array of vital nutrients which support healthy aging. Vitamin C, Copper and Biotin support your natural beauty form within. Collagen is a substance rich in amino acids, which the body needs to maintain overall health. Copper, an essential trace mineral, play a significant role in the synthesis of collagen. Vitamin C helps support natural collagen production in the body for healthy skin, while biotin helps maintain healthy nails and hair. For adults, take three (3) tablets daily on an empty stomach.